Originally introduced in 2003, the bamboo watch immediately captivated attention for its evocative look and its strong iconic power: bamboo is a Gucci trademark material and adorns accessories since 1947 when the bamboo-handle handbag was launched. 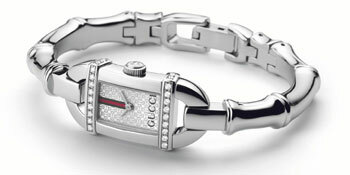 Taking inspiration from its original design, Gucci introduces newly revisited versions of this model in stainless steel, 18 karat gold plating and white rubber. Sophisticated and inspired, this timepiece is a perfect blend of all Gucci aesthetic codes, including the bamboo shaped bracelet, the green-red-green stripes, the horsebit pattern adorning the dial and the logo. Stylish and innovative the bangle bracelet has a new adjustable fastening device to fit any size wrist. For the ultimate refinement the new bamboo watch in stainless steel is also available with precious diamonds horizontally edging the top and the bottom of the case. A sparkling re-interpretation of Gucci unique and sophisticated elegance. Unmistakably Gucci. The bamboo watch.